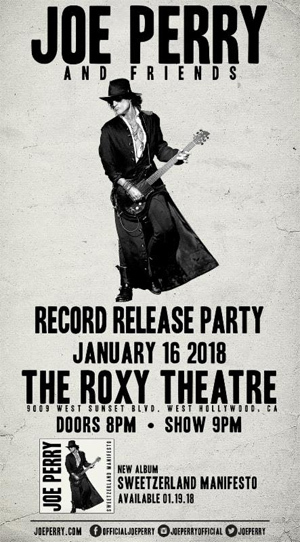 Sweetzerland Manifesto collaborators Robin Zander (CHEAP TRICK), David Johansen (THE NEW YORK DOLLS) and Terry Reid (solo artist/vocals) are among the artists already confirmed for the Roxy show with special guests likely to join the power packed group. They'll be joined by Gary Cherone (EXTREME/VAN HALEN), Dean and Robert DeLeo (STONE TEMPLE PILOTS), Buck Johnson (keyboards/vocals/AEROSMITH) and David Goodstein (drums). Set for release on his own Roman Records imprint (distributed worldwide by AMPED Distribution), Sweetzerland Manifesto--which is available for pre-order via iTunes and Amazon--marks JOE's sixth solo album and is comprised of 10 new tracks. They were all written or co-written by JOE (many with the album's guest vocalists), except for a cover of "Eve Of Destruction" with JOE on lead vocals and Johnny Depp on drums. The album features guest appearances from a long list of JOE's friends, colleagues and rock and roll icons. Highlights include "Aye, Aye, Aye", which JOE co-wrote with the track's vocalist Robin Zander, and three collaborations with David Johansen, who sings "I Wanna Roll", "Haberdasher Blues" and "I'm Going Crazy", plus as many co-writes with Terry Reid whose lead vocals light up "I'll Do Happiness" (with Zak Starkey on drums), "Sick & Tired" and "Won't Let Me Go".